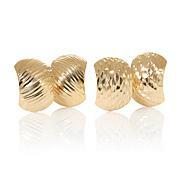 Your jewelry box staple, elevated. 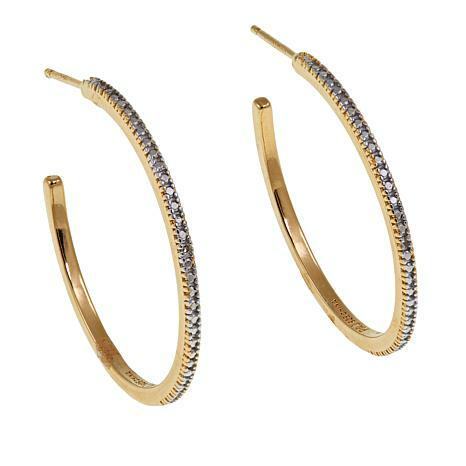 These diamond-adorned, open-style hoops have the easygoing glamour you've been seeking. 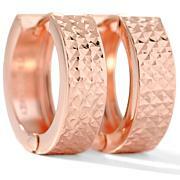 Whether you're accessorizing a little black dress or a denim jacket, they're the perfect accent. These diamonds are graded at J-K color (near colorless) and are of promotional clarity. I Love These!!!! Just the perfect size, look great & feel light on the ears. I highly recommend these - these make a great gift. I love this piece. This is my 2nd pair of this style. 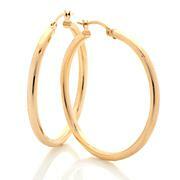 Very lightweight & perfect size hoop earrings. No allergic rxns as i have sensitive skin.I took off 1 star because of the back closure being loose that i ended up losing one, the left side.Casual or glam, very versatile pair.I ordered another pair to replace the one i lost. Great buy! 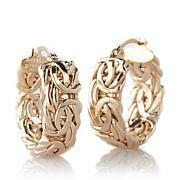 The diamonds on the front cheapen the look of the earrings. It would have been better to leave the diamonds off so you would have a nice gold earring. Also, the earring back dug into my ear so I had to remove the earring. I dont think Ill use them. These are not great! The accent is so small it merely looks like a strip of silver. Will return!